La Confrérie is a student association affiliated to Hotelschool The Hague, The Hague Campus, that is based on Dutch traditions, with an international orientation. It dates back to the year 1957 and is founded by several students that took it upon themselves to rebel against the very strict Hotelschool regime that reigned in that period and to enrich the life of all students. Student Association La Confrérie was born in 1957 and was royally approved by Her Majesty the Queen in 1965. In the past 60 years, La Confrérie has enriched the lives of many Hotelschool students and has grown into a blooming and sparkling association which respects norms and values and upholds them with great pride. La Confrérie offers its members the opportunity to create everlasting memories and friendships during their Hotelschool time. The beating heart of our association is our very own Club Bar, where members of all semesters come together to have the best times and enjoy many events, ranging from culinary- to networking- to sporting events to plain old partying. The association offers many opportunities for its members to develop themselves. With over 5000 alumni from all around the world, members will have the world at their feet regarding a professional network. 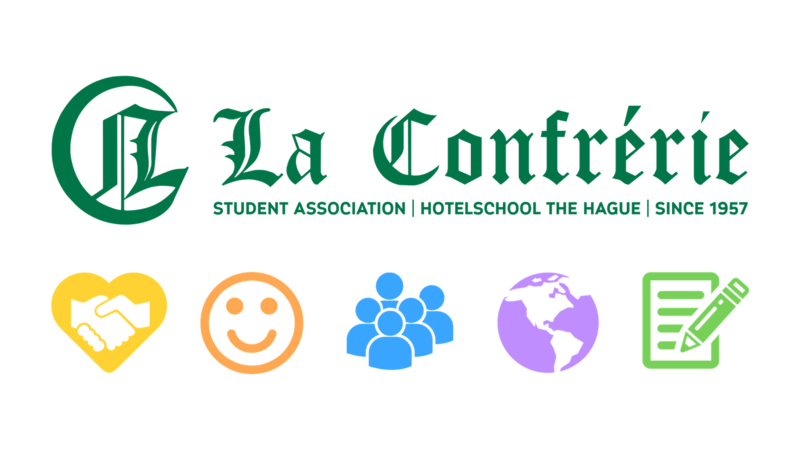 La Confrérie has a place for all talents to be further developed for people participating in its committees, fraternities, sororities, yearclubs, boards, familiale, and crews. No matter what it is that you love to do, we have a place for you to express it and you can be as actively involved in our association as you want. La Confrérie is ready to offer its members the absolute best memories, friendships, and opportunities within Hotelschool.